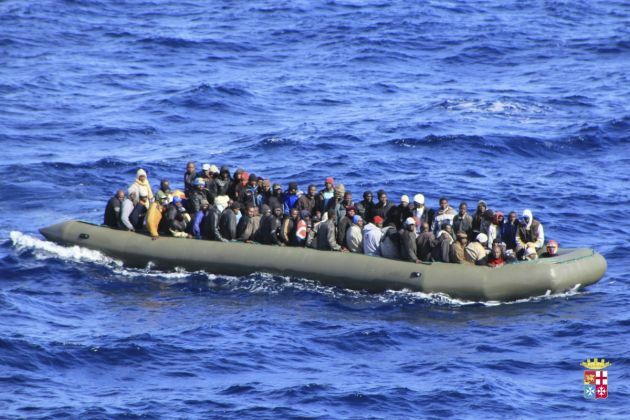 Migrants are seen in a boat during a rescue operation by Italian navy ship San Marco off the coast to the south of the Italian island of Sicily in this February 5, 2014 picture provided by the Italian Marina Militare. The Italian navy began the emergency sea rescue on Wednesday of an estimated 1,000 migrants from boats close to the island of Lampedusa, the site of a tragic shipwreck that killed hundreds five months ago, in the operation called Mare Nostrum. The Jesuit priest heading an Italian migrant center has condemned a system that encourages human trafficking from Africa to Europe following two shipping accidents that are believed to have claimed scores of live. Father Giovanni La Manna, president of the Centro Astalli which helps migrants, was quoted by Vatican Radio saying, "Enough! No more deaths at sea." The Catholic radio network reported Tuesday that the bodies of 40 people have been recovered from the seas around the tiny Italian island of Lampedusa in the latest tragedy linked to illegal migration from North Africa to Europe. Italian coast guards pulled to safety a further 200 people – including women and children. Euronews reported Monday a second shipwreck in two days of an overloaded boat carrying migrants from Africa. Italian authorities launched an operation to try and those among the 400 passengers said to have been jammed in the boat as it began sinking off the coast of the southern Italian island of Lampedusa. "When will we have the courage and dignity to save the lives of people who are fleeing war and dictatorships? "It is Europe's duty to guarantee access to seek asylum, it is a human right," said La Manna. "Today it's impossible for migrants to reach Europe without falling into the hands of human traffickers and risk their lives on these boats. It is our duty to save human lives." In 2011 at a particularly busy time of migrant activity, more than 62,000 people arrived in Italy in many boats carrying hundreds and even thousands of people that were arriving in Lampedusa each day. Lampedusa was the first place Pope Francis chose to visit after his election to the papacy. During that visit, the Pope prayed to commemorate the thousands of migrants who have died crossing the sea from North Africa. He thanked the people of Lampedusa for taking migrants in and setting an example of solidarity to a selfish society sliding into "the globalization of indifference". Francis said, "We have become used to other people's suffering, it doesn't concern us, it doesn't interest us, it's none of our business." The Pope also condemned the traffickers who profit from the migrants desperation and asked pardon for "those, whose decisions at a global level have created the conditions which have led us to this drama."